A hagraven has been turning people into birds. According to a note I discovered in Coldperch Cavern, a hagraven named Kraala uses a totem to transform people into birds. Find someone who can make the totem work. Collect the ingredients for the ritual. Watch Deechee-Noo complete her work. You can begin the quest by finding the Winterborn's Note inside the centre-south cavern of Coldperch Cavern. Warlord Uchuiran wouldn't explain anything to me, but I think I figured out the cause of the disappearances. I witnessed the warlord's lover, the hagraven Kraala, use a stuffed bird totem to transform one of our prisoners into a bird. I fear that the hagraven isn't restricting her transformations to just prisoners. I think she's using the totem on our own people! You should leave as soon as possible. I will -"
I should try to find the bird totem mentioned in the letter. Once you recover the bird totem from the ancient Nord chest near Kraala Birdsong, you must travel to the Mages Guild in Orsinium and speak to the Argonian mage Deechee-Noo. Wait. No. Don't tell me. It smells like... it smells like... a dead bird?" That's this bird totem. A hagraven used it to turn people into birds. "A bird curse? Very unusual. Very rare. But I have read about hagravens inflicting such curses on innocent people. Hagravens can be cruel and uncaring creatures. What a shame about the poor people that were transformed." Is there any way to reverse the curse? "Reverse the curse? What an intriguing concept! I don't know. There may be a way. There's a book around here somewhere that refers to such things. But breaking a curse requires specific ingredients. Would you be willing to obtain such items?" What do you need to reverse the curse? Ah, yes. A potion of feather plucking. I know Telarnel has one. And an ancient wing bone. I saw one at Rasna's stall. Oh, almost forgot! A frozen egg. Nednor always has one lying around." I'll return with the items as soon as I can. "Go on now. Hurry, hurry. Retrieve the potion and the wing bone. Oh, and the egg, of course. Mustn't forget the egg! I'll be upstairs, researching the ritual. We'll conduct it up there when you return." Can you tell me more about the items you need to return the curse? "Oh, yes, of course! I apologize. I often forget that not everyone knows as much as I do about so many interesting things. What do you want to know more about, hmm?" Tell me more about the potion. "A potion of feather plucking. The perfect concoction for quickly removing feathers from a chicken or other type of poultry - even those burdened by a bird curse. Telarnel in the alchemy shop is sure to have one. Tell her I said hello!" Tell me more about the wing bone. "An ancient wing bone, preferably from a prehistoric snow owl or an extinct flightless desert hawk, but any old bird will probably do. Rasna over in the marketplace is sure to have something we can use. Just remind her she owes me a favor." Tell me more about the egg. "A frozen egg! Can't perform any ritual of consequence without one of Nednor's frozen eggs! And they taste so delicious. Utterly sublime! Nednor has a stall in the marketplace. Just tell him it's for me. I'm his best customer!" The potion of plucking is available from Telarnel, who is located in Hydalion's Potions & Elixirs which has a convenient entrance from within the Mages Guild itself. You can either purchase the potion from her outright or use Persuasive Will to persuade her to give to you instead. "My potions are more mundane, best used to help around a farm or a homestead. You'd be surprised how many clan wives come by on a regular basis. If you want something more suited to an adventuring life, you'll need to talk to Hydalion." I need a potion of feather plucking if you happen to have one. "Well, now, that's one of my most popular elixirs! You'd be amazed how many of those I sell to the clan hearth-wives on a regular basis. I'm afraid I'm down to my last one until the next batch is ready. For that reason, it's going to cost you dearly." "Deechee-Noo! From the Mages Guild? I haven't seen her since that time we - um, well, never mind about that. Still, my potions are made with quality ingredients. Very expensive." [Persuade]That's too bad. I guess I'll have to tell Deechee-Noo you weren't willing to help her out. "Now let's not be too hasty? Take this and present it to the lovely Deechee-Noo with my compliments. And let her know that I'm free next Fredas. I have a bottle of gossamer tawny port I've been saving and I can't think of a more special occasion." TYou will then need to head to Rasna in the Orsinium marketplace for the ancient wing bone. Much like Telarnel, you can either purchase the wing bone directly or intimidate her into "gifting" it to you. "I carry only the rarest items from the ancient deserts of Alik'r. Are you a collector of rare antiquities? If not, then I fear that my wares will be of little interest to you. Have a nice day." Do you have an ancient wing bone? "Tava smiles in your general direction today, friend, for I do indeed have many ancient bones to choose from. This wing bone, for example, comes from a bird that hasn't been seen alive since the Merethic Era. May I ask why such a thing interests you?" Deechee-Noo sent me. She needs the bone for a ritual. "The lovely Deechee-Noo sent you? How intriguing. But as much as I enjoy the fair Argonian's company, I would hate to see such a rare and beautiful item destroyed. Perhaps we should just tell her I wasn't able to help you today, wayfarer." [Intimidate] Do you really want me to tell Deechee-Noo that you lied to avoid helping her? "You would do such a thing? How despicable of you! But I would never do anything to alienate to beautiful Deechee-Noo. Take the wing bone and give it to her with my deepest regards. And remind her that I look forward to our rendezvous on Turdas." Lastly, you will need to speak to Nednor who is nearby, at Green-Tusk Grocery along with Marutha the grocer. "Eggs! Beautiful, glorious eggs! Get your eggs right here! Scramble them, fry them, hard boil them - you can even throw them at people when they annoy you! You can't do that with a tomato! Well, I guess you could, but an egg works so much better!" Deechee-Noo sent me to get a frozen egg. "Deechee-Noo-? I haven't seen her since we... well, never mind about that. She does love my frozen eggs, though! I bury them in the snow near Shatul Ranch. Freezes them so solid they won't thaw in less than a week! She can't get enough of them." What do I owe you for the frozen egg? "It's for Deechee-Noo, right? No charge! Just tell that lusty Argonian that I want to see her on Loredas. She can repay my generosity with a little generosity of her own. And she'll know exactly what I mean." Upon obtaining all three items and unasked-for information on the lusty Argonian mage, you can return to her on the first floor of the Mages Guild building. "Ah, you've returned! How wonderful to see you again. Tell me, were you successful? Did you acquire the items I asked for? Did you get the frozen egg?" I acquired the items you requested. "Excellent! Then we're almost ready to begin the ritual. I just need a moment with this delicious frozen egg. Then we can proceed to remove the curse when you say the word." I'm ready. Let's start the ritual. "Frozen egg. So crunchy. So delicious. Now let's begin the ritual." "Let's see. We put the totem and the ancient wing bone in the pot. Then we add the potion." "Stand back now. Here comes the good part." "Perfect! Just like the book described! I believe the curse has been reversed." One delicious egg and a pop later, talk to Deechee-Noo. "Ah, frozen eggs! So crunchy and cold! Yum! And I'm certain that the ritual was a success. The hagraven's curse has been reversed. Another satisfying affair, if I do say so myself!" Are you sure the ritual worked? "Oh, almost certainly. I'm sure that dozens of naked people just fell out of trees somewhere in the wilderness. They're probably cold, though. Maybe I should have omitted the potion of feather plucking. Left them with something to keep them warm." You will then receive the quest reward bow and some gold. I should find Kraala's bird totem and see if I can use it to transform the birds back into people. Objective: Find the bird totem. I can't seem to make the bird totem work. 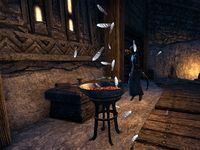 Maybe someone at the Mages Guild in Orsinium can help me figure out how to reverse the Birdsong's curse. Objective: Take the totem to the Orsinium Mages Guild. There's an Argonian in the Mages Guild named Deechee-Noo. I should ask if she knows how to reverse the bird totem's curse. Deechee-Noo asked me to collect a few items so she can perform a ritual that will reverse the bird totem's curse. Objective: Acquire Ancient Wing Bone. Objective: Acquire Potion of Feather Plucking. I gathered the items Deechee-Noo requested. I should bring them back to her so she can perform the ritual to reverse the bird totem's curse. Deechee-Noo performed the ritual and thinks it was successful. I should talk to her to make sure. This page was last modified on 7 March 2019, at 15:39.